Photograph of SCP-2124, taken upon acquisition by the Foundation from its previous location. Special Containment Procedures: SCP-2124 should be kept in a secure storage locker, sized at least 50cm by 50cm by 10cm. This locker should be kept sterile, free of moisture and airtight whenever practicable in order to prevent SCP-2124 from deteriorating. A foam insert molded to fit a 20cm-length ██████ brand kitchen knife has been added to the inside of SCP-2124 following test 2124-04 and, while removable, should be kept in place during approved tests pending approval from a senior researcher or other staff member of level-3 clearance or above. Any instances of SCP-2124-1 must be returned to the box, ideally to the molded insert, during standard storage. Testing of SCP-2124 is permitted by staff of level-2 clearance and above after filing of form F-2124-01. Following test 2124-09, testing of SCP-2124 is forbidden unless directly supervised by a staff member of level-4 clearance or above. Description: SCP-2124 is a large-sized pizza box, made out of double-layered brown cardboard. SCP-2124 contains grease-residue and upon initial discovery showed early signs of ██████ ██████ mold growth (removed upon standard sterilization procedure), but is otherwise in good condition for its age. Written in black ink, presumably by a black felt-tip-pen, upon the top of the box is the message 'CAREFUL! 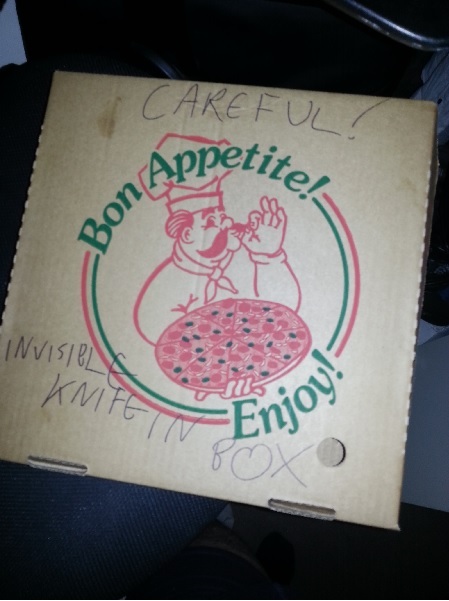 INVISIBLE KNIFE IN BOX'. All components of SCP-2124, including the ink on the warning, appear to be made of standard material with no anomalous properties. SCP-2124 is as vulnerable to damage as any cardboard pizza box, and care should be taken during testing to avoid any deterioration. "It feels almost like empty air." "It feels like I could crush it." "It might slip out of my hand if I close it too hard." SCP-2124-1 has no detectable weight or measurable presence, other than the (often uncertain) word of the subject holding the instance that they are holding the object. However, when instructed to cut objects using an instance of SCP-2124-1, the object is cut in a manner consistent with a sharp kitchen knife. SCP-2124-1 is able to cut through soft objects with no appreciable effort, through meat and firm objects with simple effort, through bone with moderate effort, and through steel with considerable effort. Exact dimensions and properties of instances of SCP-2124-1 appears to vary with test subject and testing conditions. See the abridged test log, below, for additional information. The interior of SCP-2124 appears to be empty to standard inspection, without any evidence of an instance of SCP-2124-1. All non-human interaction (sweeping with tongs, brushes, metal detectors) with the interior produces results consistent with an empty box. Blindly feeling around the interior of SCP-2124 also produces the same result. Subject(s): Researcher Clarent, under outside observation from Senior Researcher Knight and associated researchers. Events: After tests 2124-01 and 2124-02 established the general properties of SCP-2124, Researcher Clarent tested the ability of SCP-2124-1 to cut various objects, especially those that are not normally easily damaged by a standard kitchen knife. All tests were performed in a standard Foundation testing room. Researcher Clarent's work obligations - as tested by Clarent by swinging at the air around her, saying "It was worth a try." Events: D-903 and D-108 were instructed to enter the testing area. D-903 was instructed to pick up the knife, then demonstrate its effects on a provided plate of butter by plunging SCP-2124-1 as deep into the butter as possible. This was accomplished without incident, to a depth of 20cm. D-108 was instructed to take a new knife from SCP-2124. D-108 attempted to retrieve an instance of SCP-2124-1, but failed and declared SCP-2124 to be empty. D-903 was instructed to hand the knife to D-108 handle-first. D-903 expressed difficulty in properly grasping the knife by the "safe bit of the blade" [sic] but managed to do so without issue. D-108 proceeded to confirm that they were holding a knife, and demonstrated on the provided butter, to a depth of 22.5cm. At this point, D-299 was instructed to enter the testing area and subjects D-903 and D-108 were instructed to stand back and say nothing. D-299 was instructed to pick up a knife from the box and insert it into the butter as deep as it would go. D-299 was successful in inserting the instance of SCP-2124-1 to a depth of 20cm. D-108 insisted that he still had the knife, and demonstrated this fact by successfully slashing at the butter. All three D-class expressed confusion, and D-903 insisted that he held no knife and waved his open hand at the butter to demonstrate. D-108 and D-299 were instructed to place both their knives inside SCP-2124, which was successfully performed. All D-class personnel were then instructed to take a knife from SCP-2124. Only D-903, who attempted to take an instance of SCP-2124-1 first, was successful. D-299 and D-108 both insisted that SCP-2124 was empty and contained no knife. D-903 complied with instructions to place the knife back into SCP-2124, and testing was concluded. Events: D-Class were told that effects of SCP-2124-1 would be tested against itself as well as standard materials. D-Class were instructed to [DATA EXPUNGED]. Following extensive testing and security intervention following the unruly behavior from D-600, all instances of SCP-2124-1 were placed back in SCP-2124, and testing was concluded. Addendum: 21 hours following the test, D-788 succeeded in escaping their cell and severely injuring one member of security personnel before being tranquilised. D-788 claimed that "you only need to see the box once, if you know how". D-788 proved, under interrogation, that they were capable of producing an instance of SCP-2124-1. This instance varied significantly from the measurements of the molded insert placed in SCP-2124. When interrogated, D-600 and D-962 were incapable of producing SCP-2124-1 without taking it from SCP-2124. 1. After test 2124-02, it is recommended that subjects testing SCP-2124 are instructed to "pick up the handle of the knife".